A refreshing alternative to milk. 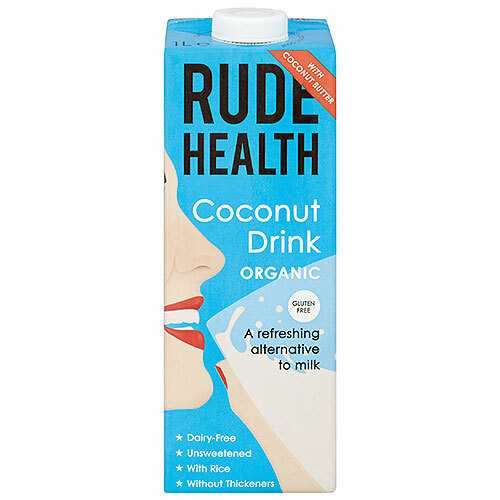 Rude Health take all the lovely white stuff from coconuts and whip it up until it’s smooth. Then they blend it with rice, pure mountain spring water and a pinch of sea salt. The coconut’s good oils give it a creamy texture, while giving you all kinds of nutrient goodies. Natural Spring Water, Organic Rice, Organic Coconut Butter(2%), Sea Salt. Use with cereals, add to coffee, add to a smoothie or shake, or even bake with it. Try it with pancakes or rice pudding instead of milk. 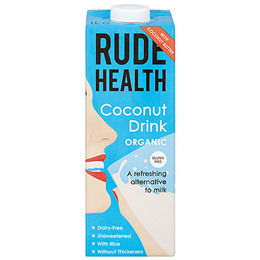 Below are reviews of Rude Health Organic Coconut Drink - 1 Litre by bodykind customers. If you have tried this product we'd love to hear what you think so please leave a review. Rude Health take all the lovely white stuff out of coconuts and whip it up until it`s smooth. Then they blend it with rice, pure mountain spring water and a pinch of sea salt.